The Homestead Lodge Bed & BreakfastThis is definitely a Bed and Breakfast with a difference. Nestled between Windermere & Ambleside. 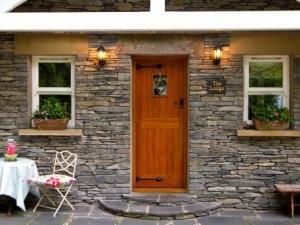 The Homestead Lodge is a fully equipped, self contained lodge offering guests B&B accommodation nestled between Ambleside and Windermere in the stunning English Lake District. This is the perfect retreat for couples who want privacy in their own holiday accommodation and for those who wish to enjoy a romantic break and time together in cosy, comfortable, contemporary surroundings. With stunning lake and mountain views from the grounds, you can relax by the fire on the wintry evenings or sit outside and take in the scenery on the balmy summer nights. In the morning your hosts will be delighted to deliver a Continental breakfast to the lodge or a full English if preferred. We can also provide our speciality of Buckwheat Blinis with Smoked Salmon and Scrambled Eggs served at your request with a nice glass of bubbles, to celebrate a birthday or wedding anniversary or just a special weekend away. Homestead Lodge is set in an ideal location. We are a 5 minute drive to Windermere and a 10 minute drive to Ambleside. For those who have a car, we have secure parking at the lodge and electric gates. Bring your bicycles and leave your car safe in the knowledge it is secure while you explore the breathtaking scenery of the Lakes on your bikes. In the evenings walk to our local pub which is just a 2 minute walk away. For those who wish to enjoy a meal in a restaurant, Windermere offers a wonderful array of restaurants and pubs. Both Ambleside and Windermere offers many tourist attractions that will keep you busy both through the day and evening. Babies until 2 years welcome, not suitable for over 2 years. The Homestead Lodge limits bookings to 2 or more days. Check in from 4.00. Check out from 11am. Dinner is available on request, served in your own private lodge. A picnic or packed lunch can be prepared on request. From the M6 Motorway, Northbound, leave at junction 36 and follow the A591 towards Windermere / Ambleside. Pass Windermere town centre on the left hand side and continue on the A591 towards Ambleside. Pass over a mini roundabout and after approx 0.7 of a mile The Homestead is on the left with electric black gates just before Troutbeck Bridge and before The Sun Inn. Please ring the bell at the gates on arrival.